Given how rapidly Russia moved from near-bankruptcy in 1998 to what seemed like unprecedented prosperity in 2007 and early 2008, perhaps we should not be surprised that Russian financial markets have been hit even harder than those in the United States, Europe and Asia. In addition, the original oligarchs, along with the new ones who rose to wealth with former President Vladimir Putin’s help, have suffered especially large reversals. Billionaires from Oleg Deripaska to Roman Abramovich have lost more than $230 billion as the combined wealth of Forbes magazine’s 25 richest Russians tumbled 62 percent from May 19 to Oct. 6, Bloomberg reported. How did all of this happen? You have to hand it to the Russians. No matter how bad things might be today, they can always suprise you — and make tomorrow so much worse you can’t believe you thought yesterday was bad. These are frightful times. The U.S. financial crisis is clearly the worst since the Great Depression. New York University Professor Nouriel Roubini has long forewarned that this crisis was under way. Subprime mortgages were a sham from the outset, and the government should have regulated them — and the derivatives on which they were based — more closely. Moreover, the U.S. Federal Reserve maintained excessively low interest rates for too long, leading to an excessive monetary expansion. The U.S. financial system had too little capital for the large credits it issued, especially the ones issued by government-sponsored Freddie Mac and Fannie Mae. The economic boom was too long and magnificent to believe. Booms breed corruption, while recessions strengthen morals. Now, we are waiting for the next shoe to fall. Surprisingly, no hedge-fund failure has been truly spectacular as yet, but some private equity funds are bound to be hit. Amazingly, forecasts for the U.S. economy for next year are still suggesting growth of 2 percent. That is not likely, however, since the current financial turmoil will inevitably hit the real economy. Both investment and consumption are bound to be constrained as U.S. consumers will try to restore a normal savings ratio, and this will make the economy slump further. A number of large companies in sensitive, cyclical industries such as automobile manufacturing, aviation and construction will probably go under. On March 26, I wrote a column in this newspaper arguing that Russia was likely to be the safest haven in the event that “the United States approaches a 1929-like depression.” Well, now we are there, but I am no longer convinced that “Russia will most likely suffer the least” from the turmoil. In a week of extraordinary events, Friday’s 30 per cent bounce in Russia’s stock market ranks with the best of them. The $130bn support package stitched together during Moscow’s two-day market shutdown achieved its immediate goal. But, like the bigger crisis 10 years ago, Russia’s crash of 2008 has long-term implications. First, it punctured the conceit that Moscow can soon become a global financial centre. The market plunge exposed deep cracks in its financial infrastructure. Russia must deepen its domestic capital pool, accelerate moves to get pension funds into equities, and develop its retail investment market. It must cultivate properly functioning domestic bank lending so that businesses can finance themselves on competitive terms. And it must ensure future central bank liquidity injections are more efficiently disbursed into the financial system. Now here is an example of the blogosphere at its best. Step #1: We put up a post analyzing the Russian stock market crash. Step #2: Posting a link, commenter “Dobo” shows us a report on Kavkaz Centre talking up an interview by former deputy PM Boris Nemstov on the same subject. Step #3: We ask for a link to the source interview. Step #4: Another commenter (“Felix“) provides it. Step #5: Our expert translator Dave Essel offers his brilliant English rendering. Mind you, all this is gratis, work donated to help the people of Russia escape from dictatorship. Step #6: We publish it (after the jump). 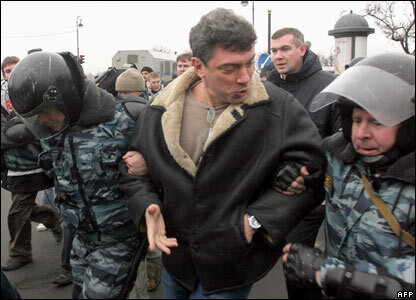 But for this chain of events, Mr. Nemtsov’s brave insights might never have seen the light of day in English. It makes us a very formidable community. Let’s have more of the same, shall we? Today, the whole world is being hit by a tremendous financial crisis, but Russia is facing a perfect storm. The Russian stock market is in free fall, plummeting by 60 percent since May 19, a loss of $900 billion. And the plunge is accelerating. As a result, Russia’s economic growth is likely to fall sharply and suddenly. One problem is that, after a long period of fiscal prudence, Russia’s government has shown extraordinary ineptitude. Russia has enjoyed average annual economic growth of 7 percent since 1999. With huge current-account and budget surpluses, it had accumulated international reserves of $600 billion by July. Its public debt was almost eliminated. But the open economy that has bred Russia’s economic success requires the maintenance of sensible policies to succeed. President Dmitry Medvedev likes to blame Russia’s stock market troubles on the global financial crisis that was triggered by the U.S. housing market bust, while critics of Medvedev and Prime Minister Vladimir Putin see it as the result of the government’s mistakes. The truth lies somewhere in the middle, but probably closer to Medvedev’s position. Developing markets fluctuate in unison, so most of Russia’s losses can be attributed to investors’ jitters over the worsening global crisis. But the MSCI Emerging Markets Index, which tracks stock markets in developing economies, fell by just 20 percent since May, while Russia’s stock market dropped by more than 40 percent. This suggests that Russia’s leadership played a significant role in the stock market decline.